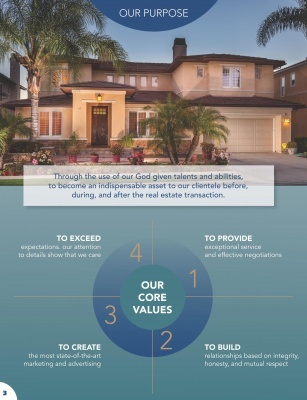 Aaronson Group's Extensive Marketing Plan For Orange County Home Sellers- We Get Top Dollar! We know the process of selling a home can be a stressful time for our clients. That's why we work hard to sell our clients' homes quickly and for the best price possible. It's our goal to surpass expectations and to provide outstanding service to every one of our valued clients. 1. Performing a thorough comparative market analysis to determine the most appropriate listing price for your home. 2. Offering a FREE Interior Decorator Consultation for expert home staging advice to get your home seen in its best light. 3. Professional photography including sunset lighting and pictures to optimize the appearance of your home in all aspects of our marketing and the Multiple Listing Service. 4. Providing professional high quality brochures for potential buyers complete with glossy photos and full details about your home's features. 5. Installing "For Sale" signage placed on your property with our website rider bringing prospective buyers to view your home online. 6. Conduct a broker open house/preview and advertise and host open houses (at seller's convenience) assuring maximum exposure for your home. 7. Listing your home in our local Multiple Listing Service with an extremely detailed description, multiple photos with descriptions, etc. Having a complete and excellent description is key in showing your house off to over 20,000 Licensed Realtors throughout Southern California. 8. Working competently and diligently to get your home on over 125 various websites. Our team constantly researches and studies the latest online trends so we know the best websites that generate the most traffic from online consumers (while most Realtors typically just post your home on the MLS). 9. The most recent trend in online technology is video. Creating a personalized video showcasing your home and its features and posting it on youtube and other video sites for enhanced exposure. We also optimize your video for search engine placement. 10. Creating a professionally produced videocast of your home which in turn will be included in the MLS media section, emailed to thousands of agents and brokers, and added to our other marketing tools. Extremely effective! 11. Advertising your home on Realtor.com with enhanced features-we pay extra to showcase our listings. Realtor.com is a leading website for home buyers searching for a home. 12. 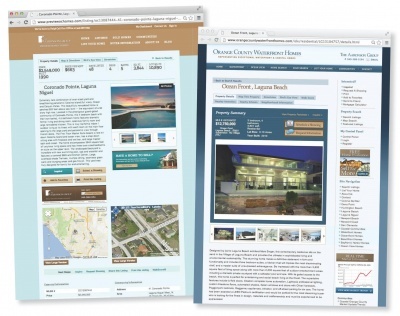 Featuring your home on our websites, http://www.previewochomes.com AND http://orangecountywaterfronthomes.com/ where your home will be seen by over 15,000 visitors a month! 13. Also featuring your home on LuxuryRealEstate.com and LuxuryHomes.com where we have a co-marketing membership including website, unique homes magazine, luxury real estate magazine, social media and more. 14. Seeking 1st page ranking on Google for your home. Optimizing the listing of your home by subdivision and city to get on the 1st page of Google and other search engines. 15. We have over 200 actively looking buyers we work with at any given time. We contact them directly and tell them about your home. 16. In addition to our "actively looking to buy" client list, we have buyers in our database categorized by price range and area. Our team contacts potential buyers wanting your home's features and tells them about the specific amenities your home offers. 17. Your home will have its very own webpage with just your home for sale including multiple photos, virtual tour, school information, demographics and more. 18. Matching up your home to buyer searches in the MLS (otherwise known as Reverse Prospecting). When we find a match, we contact that buyer's agent to let them know your listing matches their buyer's search criteria. 19. Creating a comprehensive print marketing campaign where we advertise your home in several major publications (as market conditions warrant). 20. Sending out "just listed" postcards to the 200 neighboring homeowners, we have found fellow homeowners to be the best advocates for your neigborhood. 21. Featuring your home in both our print and online newsletters. 23. 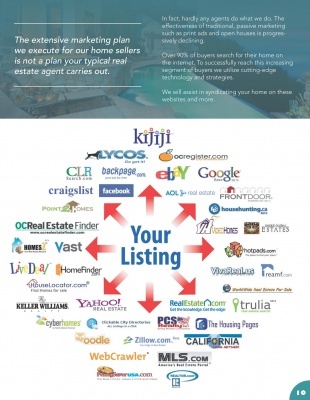 E-mailing a personalized flyer of your home to 20,000+ agents and brokers throughout Orange County. 25. Promoting your home and its features at our Keller Williams office meeting each week to over 200+ Agents and marketing your home via Keller Williams Luxury Homes International. 26. We have found that communication is critical for our sellers. With our electronic lockbox installed at each of our listings, we are able to follow-up on every showing for feedback from agents and their prospective buyers. With this feedback, we can then make recommendations to improve the marketability of your home. 27. Communicating regularly to let you know the progress we're making towards getting your home sold including the number of showings, buyer inquiries, etc. 28. Daily e-mail updates on market activity for your subdivision and/or area including any new listings, price changes and sales. 29. In the current market environment, pre-approval of buyers with a lender is more important than ever. We contact any prospective buyers lender to make sure that they have been pre-approved not just pre-qualified and that assets have been verified before we submit an offer. 30. Our expert in contract negotiation will negotiate on your behalf. Kevin Aaronson is highly experienced and is one of the best in the business! 31. We handle all correspondence and negotiations with the lender, appraisers, escrow, title, and inspectors to ensure a smooth, on time closing. If you're thinking about selling your home in, please fill out the form below to receive a free consultation.